“Demon Pond” is a retelling of the classic Kabuki play sharing the same name. The story has been adapted to the screen once before by critically acclaimed director Masahiro Shinoda (“Double Suicide”, “Ballad of Orin”). This retelling, features a revised story by Keishi Nagagatsku. The play was recorded during a sold-out live performance, to be broadcasted on TV at a later date. A storyteller who goes on a journey to master his craft soon finds himself involved in a fantastic tale of his own. With a bell protecting a town from the wrath of the gods who wish to flood the it, the young man finds himself the new protector after the previous caretaker dies in his arms. At first resolving only to ring the bell once, then move on, he soon falls in love with the young woman who watches over the nearby shrine and begins to believe the myth surrounding the mysterious bell. Meanwhile, a goddess is growing tired of the pact and plans to send her kin to go forth and destroy the bell so that she can flood the town. 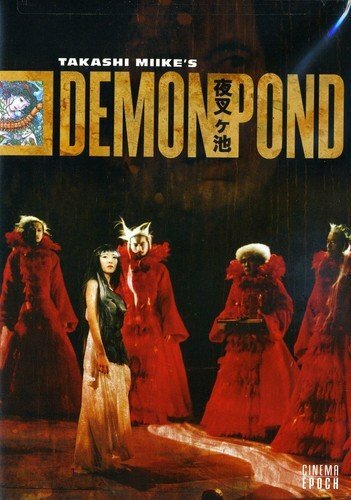 Given that “Demon Pond” is a recording of a live theater play, it becomes a bit difficult to compare it to any of Miike’s other productions, and the format will add as a disconnect for many fans of the director. However, perhaps the biggest take away from this film is that it shows Miike’s versatility as a director, and showcases what many feel have always been Miike’s greatest strength: the ability to adapt within any genre and utilize the strength of the cast and visuals to make his subject matter work. With this idea pushing the viewer to garner more respect for the director’s talents, the rest of the review will straddle more the line of whether the film is successful. However, any critique should be underscored by the fact that, regardless of personal enjoyment, that this is a highly commendable effort from a director who does not normally work within the world of theater. As a narrative, the story in “Demon Pond” is interesting enough to garner it’s running time of over two hours. There is some flaw in the film through it’s homage to the original content, as well as taking place in a live theater set up. With the story focused towards fans who appreciate classic Japanese performing arts, the story will create a large disconnect with those who prefer cinema and are not too brushed up on the nuances of theatrical performance. This I think is most highlighted within the reaction of the live audience, the film can be described as light-hearted, but without the cues from the theater being filled with laughter, most of the comedy would be lost. The play itself is a very minimal production, all taking place on a single set with no backdrop changes, minimal costumes, and barely audible music. Thankfully, for the most part this plays to the strengths of the production, focusing on the actors’ performances over the space itself. The only major critique may come within the audio design, as perhaps an emphasis on music would have heightened the production, as what little soundscapes do exist, seem rather haunting, which is also overshadowed by audience reaction as every cough can easily be heard. Overall, the inclusion of the audience reactions could have been avoided, instead recording a rehearsal with more prominent audio may have made for a more enjoyable and immersive experience for those unable to see the play live. The greatest technical aspect of the film lies within the cinematography, as the camera set up and editing really shine through and do give the minimal format a more competent cinematic appeal. The film transitions from performances and wide shots in a rather seamless way, given the single scene nature of a play. The film casts familiar and recognizable screen actors in the play, such as Miike main staple Ryuhei Matsuda (“9 Souls“, “The Scythian Lamb“). Having familiar film actors added appeal to the production as it was great to see the cast making the jump from film to theater, which does contain a fair amount of differences in execution. However, it is hard to overly praise any single performance, since my previous experience with theater comes by way of either enjoying the characters or finding certain roles tiresome. No one in the production weighs down the fellow casts members, resulting in a consistent performance and a well maintained atmosphere through the entire duration. Takashi Miike’s “Demon Pond” is most likely to appeal to a very niche and small audience among Western viewers. Most likely, if not having the director attached to the project, this may have stayed in obscurity and completely unknown in the west. For those who are looking to tackle the director’s entire filmography, enjoyment is more likely to base among growing respect and understanding of the director’s talents. Outside of the connection with Miike, or the cast, the film borders on unwatchable. Given the realization that this could have been a pleasurable viewing experience within the live atmosphere, it creates an odd parallel between my personal experience and my critical opinion. There are positive talking points to be found within the film, and the production is a well executed stage performance. However, translating into a cinematic experience, it is hard to point to a single moment that I found enjoyment or interest with the content. There may be a wider appeal to those who appreciate live theater, and although I have had a fair amount of exposure to it, it has never connected with me in such a deep and meaningful way as the film has. I believe, anyone with a similar mindset to the medium will draw similar conclusions about “Demon Pond”.